Nandan Nilekani (born 2 June 1955) is an Indian entrepreneur, bureaucrat and politician. He co-founded Infosys and is the non executive chairman of Infosys replacing R Seshasayee and Ravi Venkatesan, who were the co-chairs of the board, on 24 August 2017. After the exit of Vishal Sikka, Nandan Nilekani was appointed as non executive chairman of the board effective August 24, 2017. He was the chairman of the Unique Identification Authority of India (UIDAI). After a successful career at Infosys, he headed the Government of India's technology committee, TAGUP. He is a member of Indian National Congress but not active in politics as of 2015. Nandan Nilekani was born on 2 June 1955 at Bangalore, Karnataka. His parents Durga and Mohan Rao Nilekani are from Konkani Goud Saraswat Brahmin community originally from Sirsi town in Uttara Kannada district of Karnataka His father worked as a general manager of Mysore and Minerva Mills and subscribed to Fabian Socialist ideals that influenced Nilekani in his early years. Nilekani's elder brother, Vijay, works in the Nuclear Energy Institute. Nilekani studied at the Bishop Cotton Boys' School and St. Joseph High School Dharwad, Karnataka PU College Dharwad and received a bachelor's degree in electrical engineering from the Indian Institute of Technology Bombay, Mumbai. In 1978 he started his career at the Mumbai-based Patni Computer Systems, where he met and was interviewed by N.R. Narayana Murthy. In 1981, Nilekani, Murthy, and five others left Patni to start their own company, Infosys. Nilekani became the chief executive officer of Infosys in March 2002 and served as CEO of the company through April 2007, when he relinquished his position to his colleague Kris Gopalakrishnan and became co-chairman of the board of directors. Before assuming leadership as CEO in 2002, Nilekani held various posts, including managing director, president, and chief operating officer. He served as its CEO from March 2002 to April 2007. During his five-year tenure as CEO, Infosys' topline grew sixfold to $3 billion. In 2017 he returned to Infosys after the exit of CEO Vishal Sikka to become a chairman. Upon his return he changed power centre from California back to its Bengaluru headquarters. Also such people as R. Seshasayee (a chairman and board director), Ravi Venkatesan (a co-chairman), Sikka (executive vice chairman and director), and Jeffrey Lehman and John Etchemendy (directors) resigned from their posts. Nilekani left Infosys in July 2009 to serve as the chairman of the Unique Identification Authority of India, a cabinet-ranking position that he entered under the invitation of Prime Minister Dr. Manmohan Singh. As chair of the UIDAI he is responsible for implementing the envisioned Multipurpose National Identity Card, or Unique Identity card (UID Card) project in India. This initiative aims to provide a unique identification number for all residents of India and will be used primarily as the basis for efficient delivery of welfare services. The identification method will be biometric, and the drive to create this government database of the entire population of India has been called "the biggest social project on the planet." They developed Aadhaar, which is an India's biometric ID system, a database, which contains demographic information, home addresses of Indians. In April 2017 1.14 billion Indian people got their ID number. In 2016, World Bank Chief Economist Paul Romer called Aadhaar “the most sophisticated ID programme in the world.” This program is criticized for violating people's privacy and exposing personal information. He is a member of the board of governors of the Indian Council for Research on International Economic Relations (ICRIER) and the president of NCAER. He also sits on several advisory boards, including those of the World Economic Forum Foundation and the Bombay Heritage Fund. Nilekani has appeared on The Daily Show with Jon Stewart to promote his book Imagining India: The Idea of a Renewed Nation  and spoke at a TED conference in 2009 on his ideas for India's future. Nilekani joined Indian National Congress in March 2014 and contested from the Bangalore South constituency where he lost by 228,575 votes to BJP candidate Ananth Kumar in the 2014 Lok Sabha election. Nilekani is chairman of EkStep, a non-profit literacy and numeracy platform. Set up by the Nilekanis with an initial commitment of $10 million (about Rs 65 crore), EkStep looks at solving the 'learning problem' by creating a technology-led platform to help children in improving their 'learning outcomes' quite early in their life. EkStep intends to do it using gamified apps, hosted in the Google Play Store. Nilekani is also a serial investor and he has invested in around 12 start-ups till date which includes: ShopX, Juggernaut, Mubble Networks, Fortigo, P2SME, RailYatri, Axiom Consulting, Systemantics India, Sedemac Mechatronics, Disha Medical Services, Tracxn, LetsVenture and TravelTriangle. In 2017 Nandan and wife Rohini decided to donate 50 per cent of their wealth to Giving Pledge, which is a movement organized by Bill Gates. The reason why they joined this movement was as following: "We see inequality is increasing sharply in most countries. We see the young and the restless in this interconnected globe, unsure of their future, wanting more but anticipating less." He also donated money to rebuild the hostel campus of IIT Bombay. Nilekani is married to Rohini Nilekani (née Soman), whom he met at a quizzing event at IIT. They have two children, Nihar and Janhavi, each of whom has received an undergraduate degree from Yale University. His first language is Konkani. In addition to Konkani, he speaks Kannada fluently along with Hindi, Marathi, and English. The Nilekani family has a 2.29 percent stake in Infosys as per the quarter ended June 2017. He was awarded an honorary Doctor of Law degree by the Rotman School of Management at the University of Toronto on 31 May 2011. He was named Corporate Citizen of the Year at the Asia Business Leaders Award (2004) organised by CNBC. Was presented the 'Legend in Leadership Award' by the Yale University in November 2009. He is the first Indian to receive the top honour. In January 2006, Nilekani became one of the youngest entrepreneurs to join 20 global leaders on the World Economic Forum (WEF) Foundation Board. 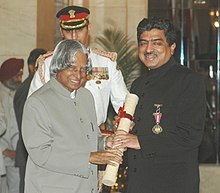 Nilekani was awarded one of India's highest civilian honours, the Padma Bhushan, in 2006. Also in 2006, he was named Businessman of the Year by Forbes Asia. India Today magazine ranked him 12th in India's 50 most powerful people of 2017 list. In 2017 he received the Lifetime Achievement Award from E & Y. CNBC- TV 18 conferred India Business leader award for outstanding contributor to the Indian Economy-2017. He received the 22nd Nikkei Asia Prize for Economic & Business Innovation 2017. Nandan Mohan Nilekani. Imagining India: The Idea of a Renewed Nation (19 March 2009 ed.). Penguin Press HC. p. 528. ISBN 1-59420-204-4. Nandan Nilekani; Viral Shah. Rebooting India: Realizing a Billion Aspirations (3 November 2015 ed.). Penguin Books Limited. p. 340. ISBN 978-81-8475-084-3. ^ "Election Results 2014: Karnataka's Nandan Nilekani Loses on Political Debut". NDTV. Retrieved 19 February 2019. ^ "Failing at politics--successfully, the Nandan Nilekani way". VCCIRCLE. Retrieved 19 February 2019. ^ Limited, Infosys. "Infosys' Mr. Nilekani is Non Executive Chairman of Board". www.Infosys.com. Retrieved 19 January 2018. ^ Infosys Technologies Limited. "Nandan M Nilekani Appointed as Chairperson of Unique Identification Authority of India". Infosys. ^ Special Correspondent (7 June 2010). "Finance Ministry sets up technology advisory group". The Hindu. Retrieved 10 April 2013. ^ "BBMP polls: Nandan Nilekani says he's 'inactive in politics', asks voters to elect the best candidates". IBNLive. Retrieved 22 December 2015. ^ Self. "About Nandan Nilekani". self. Archived from the original on 18 April 2014. Retrieved 18 April 2014. ^ "Congress trying hard to wrest Bengaluru from clutches of BJP in Lok Sabha polls". Livemint. Retrieved 18 March 2019. ^ "The Persistence Of The Brahmin". Outlook India. Retrieved 18 March 2019. ^ Parker, Ian (3 October 2011). "The I.D. Man". The New Yorker. Condé Nast: 26–34. Retrieved 6 July 2013. ^ "It Looks Like the Creator of India's Invasive National ID Accidentally Tweeted His Personal Info". gizmodo.com. ^ a b Nandan M. Nilekani | World Economic Forum – Nandan M. Nilekani. Weforum.org. Retrieved on 13 December 2012. ^ "The Daily Show with Jon Stewart Official Website | Current Events & Pop Culture, Comedy & Fake News | Comedy Central". Thedailyshow.com. 18 March 2009. Retrieved 28 June 2009. ^ TED2009. "Nandan Mohan Nilekani's ideas for India's future | Video on". Ted.com. Retrieved 10 April 2013. ^ "Page Not Found". ECIResults.nic.in. Retrieved 19 January 2018. ^ "Congress's first list for LS polls: Rahul, Sonia, Nilekani among 194 candidates named". The Times of India. PTI. 8 March 2014. Retrieved 8 March 2014. ^ "Nilekani: Nandan Nilekani joins battle to map India's post-cash future". The Economic Times. Retrieved 4 January 2017. ^ Reporter, B. S. (9 April 2014). "Nilekani richest candidate in 2014 polls". Retrieved 19 January 2018 – via Business Standard. ^ "EkStep". www.ekstep.org. Archived from the original on 23 December 2015. Retrieved 22 December 2015. ^ "Nilekanis' EkStep clicks education with its first app". Retrieved 22 December 2015. ^ "NCAER - Quality . Relevance . Impact". www.NCAER.org. Retrieved 19 January 2018. ^ "ShopX - Changing the face of Ecommerce, Enabling Every Town to Shop". SHOPX - Organising Commerce Through Technology For Everyone. Retrieved 19 January 2018. ^ "Tracxn". www.Tracxn.com. Retrieved 19 January 2018. ^ "Want to invest in start-ups? Nandan Nilekani reveals how he chooses them". HindustanTimes.com/. 25 September 2016. Retrieved 27 December 2016. ^ "School and IIT". Imagining India. Archived from the original on 25 July 2009. Retrieved 28 June 2009. ^ "Nilekeni's daughter to wed her Yale senior". The Indian Express. 17 August 2011. Retrieved 15 April 2014. ^ "Nandan Nilekani likely to return as Infosys head: Sources". Moneycontrol. Retrieved 19 January 2018. ^ "Watch Nandan Mohan Nilekani's address to Convocation". alumni.utoronto.ca/. Archived from the original on 8 April 2014. Retrieved 5 April 2014. ^ India Today Youth Summit 2010, 25 September, New Delhi. Indiatoday.intoday.in (25 September 2010). Retrieved on 13 December 2012. ^ "The story continues". Imagining India. Archived from the original on 26 July 2009. Retrieved 28 June 2009. ^ The 2009 TIME 100 – Nandan Mohan Nilekani Time. ^ "Nandan Nilekani to be given Legend in Leadership award by Yale - Times of India". IndiaTimes.com. Retrieved 19 January 2018. ^ Padma Bhushan Awardees – Padma Awards – My India, My Pride – Know India: National Portal of India. India.gov.in. Retrieved on 13 December 2012. ^ Nilekani as Businessman of the Year: Forbes Asia – Oneindia News. News.oneindia.in (1 December 2006). Retrieved on 13 December 2012. ^ "India's 50 powerful people". India Today. 14 April 2017. Wikimedia Commons has media related to Nandan Nilekani.